With the experience and know-how of our staff in dealing with these complex machines, special jobs such as the manufacture of highly complex parts with freeform surfaces can be undertaken. We manufacture to high standards and with perfect quality even with parts hidden from view such as the minute wheel that connects the minute and hour hands beneath the dial. One of many parts of the movement that we produce and process entirely in-house. From intermeshing to roller burnishing, we offer the technical options and the know-how. With the eccentrics in the balance wheel, the oscillation system of our movement reflects the state of the art. The balance wheel is also produced, inspected, balanced and adjusted entirely in-house. As a supplier business we contribute to further the strengthening of the competitiveness of high-quality German watchmaking. 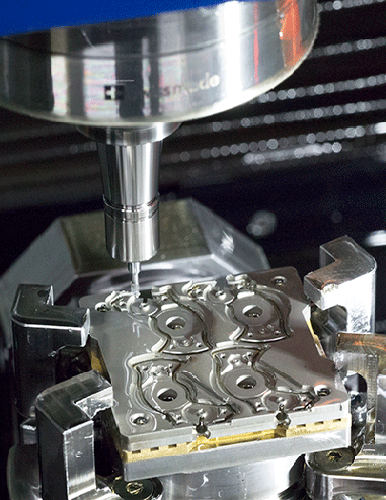 Thanks to the latest lathes and precision 7-axis, 5-axis and 3-axis machining centres, CNC production offers all the opportunities of both automatic mass production runs and short-run and individual part production as well as the opportunity for handling customer-specific prototypes and pre-production. 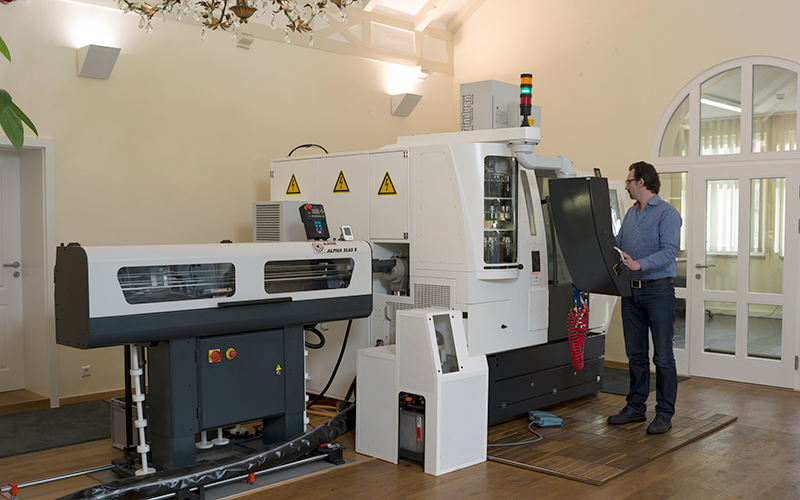 The Almac CU 1007 CNC processing centre is equipped with a total of two work booths, each with options for 3 to 5-axis processing. Between these two is located a Stäubli robot cell that can rotate, load and unload workpieces for processing with “Pick and Place”. This machine is intended for the manufacture and finishing of flat or milled parts such as springs, levers, plate parts, brackets and bridges. 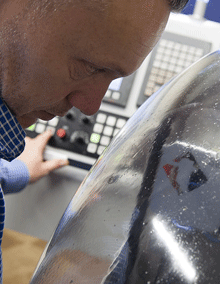 Precise and complex components can be manufactured using 7-axis processing with the CNC turning and mailing centre. 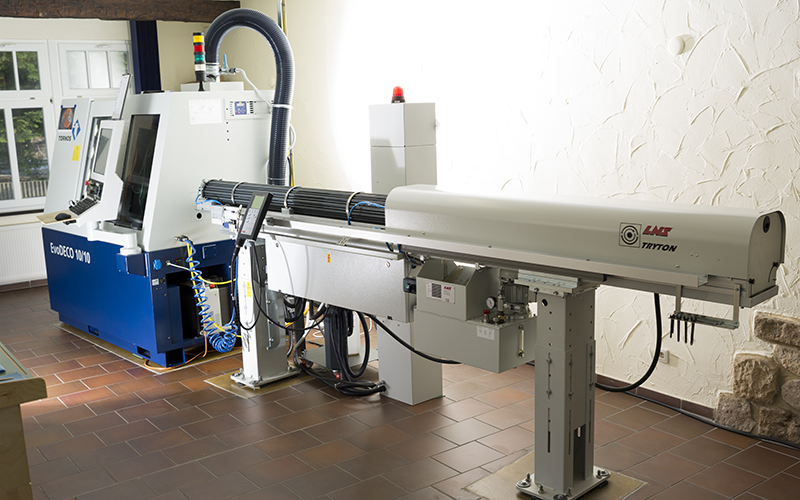 Thanks to its very robust mechanical design and linear drive technology, accuracy of a few micrometres (<3 µm) can be achieved. 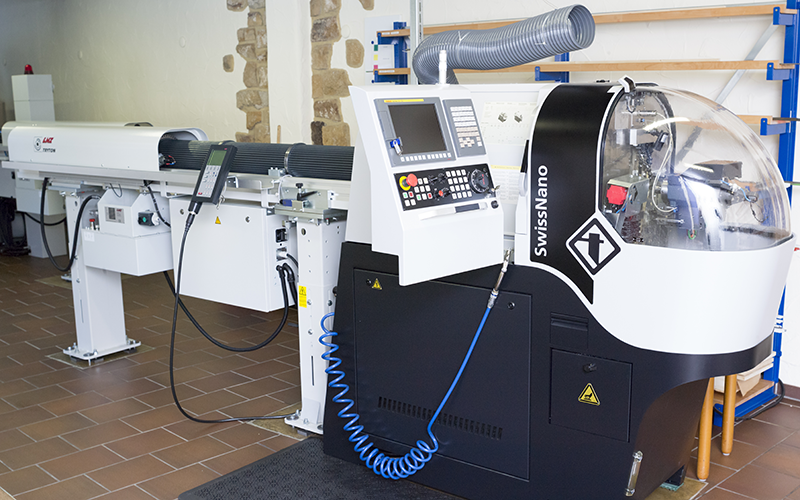 An integrated, individually adjustable automatic unit permits the production of prototypes. 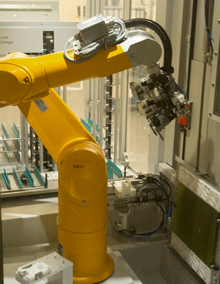 Moreover, with the aid of LNS bar feeders and a robot cell with “Pick and Place”, this design offers the option of fully-automated long production runs. Thanks to its exceptional flexibility, the most complex parts can be produced on this and despite that it is quick to reconfigure. 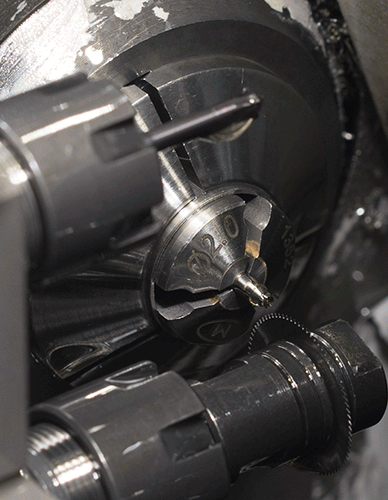 The long automatic lathe has a total of 20 tools including up to 10 powered and 8 milling or drilling tools etc. 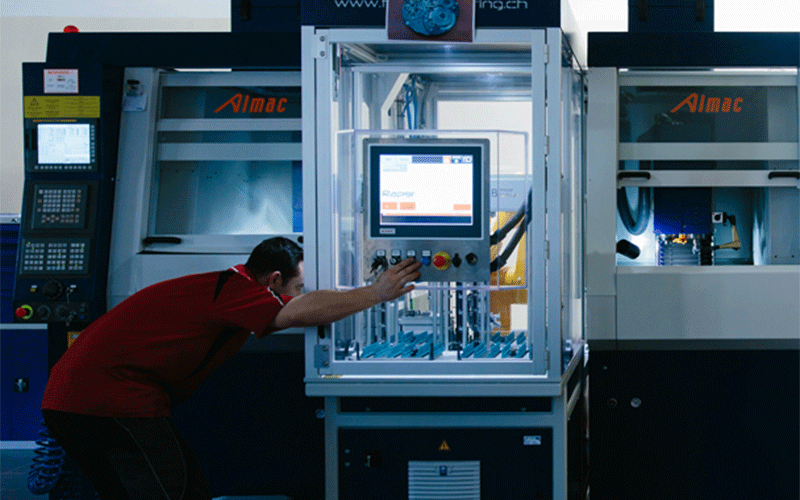 Simultaneous processing with 4 tools (3 in the main processing direction and 1 in the opposite direction) offers the fully automated production of complex small parts of up to a max. diameter of 10 mm or other high-precision parts. 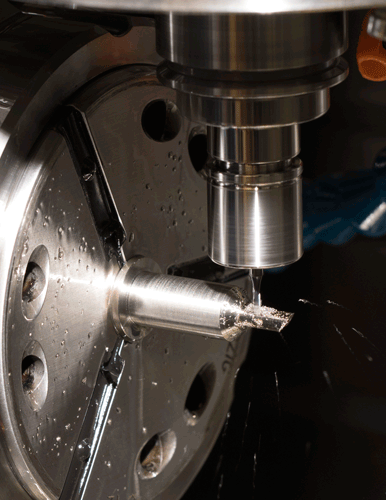 This long lathe is used for processing the smallest parts with micro-precision. With its kinematics, for instance, 2/3 of the parts of a clockwork movement can be produced, from simple to very complex parts such as winding stems, including for example gear milling for sprockets, with excellent quality surface finish. But it can be used not only for watch manufacture but anywhere where the highest quality and precision are required.